Hello one and all! 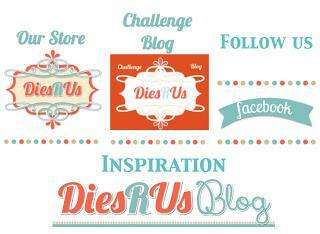 Kristina H. here with a new project to share with you. This card was a heck of a lot of fun to make and a first for me. A side waterfall card! I hope you guys are ready for a whole bunch of photos! I actually remembered to snap a few pictures during the creation process. 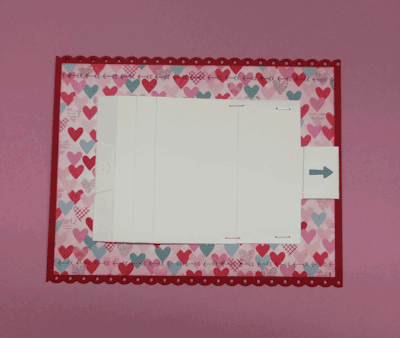 I saw a video by Karen Burniston where she shows how to convert the Frame Pull Pop-Up die into a waterfall card. I knew as soon as I saw it that I really wanted to give it a try! The first thing I did was to cut a red base to 4 1/2" x 5 1/2". 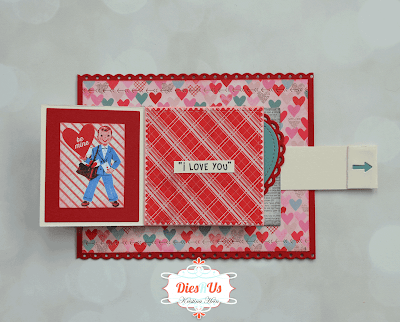 I used the scalloped edge die from the Lawn Fawn Valentine Borders to cut at the top and the bottom. This makes the finished size to 4 1/4" x 5 1/2" inches. 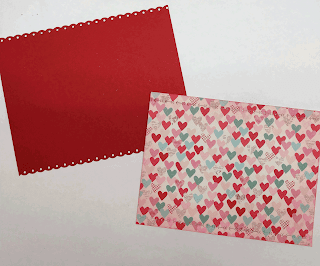 Next I cut the fun heart paper down to 4" x 5 1/4" inches. 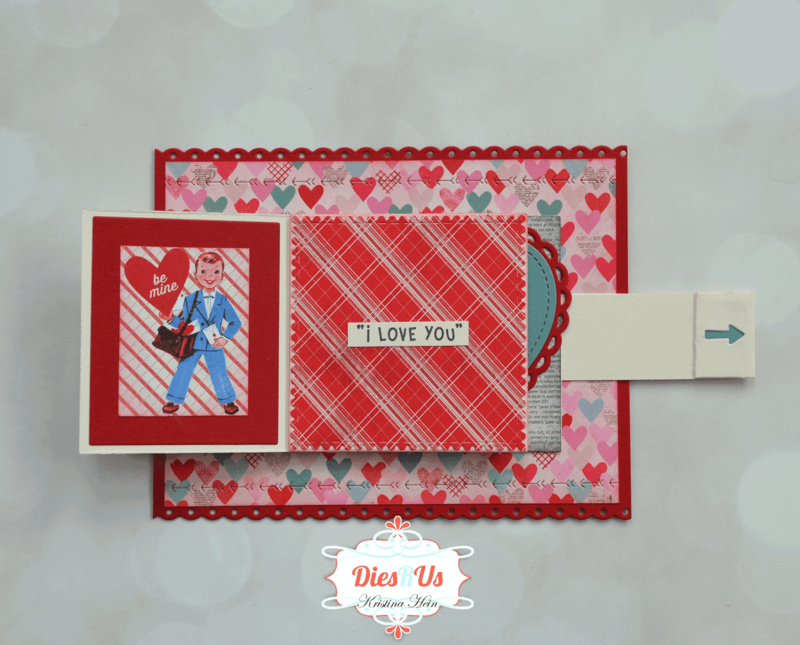 Then I used the arrow die from the same Lawn Fawn Valentine Borders set on the top and bottom of the heart paper. Here's a close up so you can see the cute arrow detail. I sponged red ink on all of the edges of the heart paper and then glued the two pieces of paper together. Now that I had a base it was time to move on to the waterfall portion. The picture below shows all the pieces that I cut out with the Frame Pull Pop-Up die to create the waterfall. I used an ivory colored cardstock for all of the pieces. 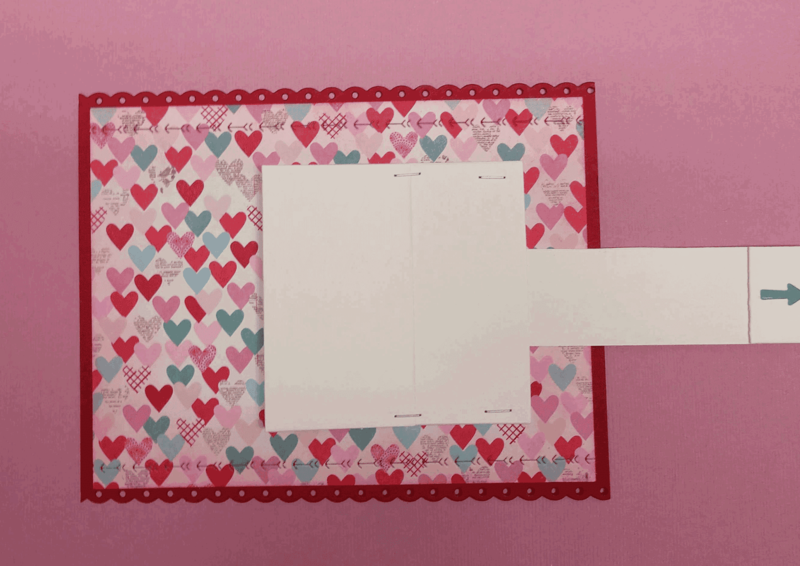 The next picture shows the basic waterfall piece attached to the card in the open position. I recommend you check out the video from Karen Burniston HERE for the complete waterfall tutorial. And this is how it looks with the pull strip pulled all the way out. Moving on! I sponged pink ink, blue ink and red ink onto the edge of three ivory squares. These get attached to the waterfall mechanism at each of the 3 fold lines. Next I pulled out more coordinating paper from the Authentique Lovestruck paper pad. All of my patterned papers come from this same collection. I cut three different papers out using the Tutti Designs Scalloped Stitched Nesting squares dies. For the bottom paper I used the sqaure die from the Frame Pull Pop-Up die and an ivory text paper. I sponged black ink around this piece before gluing it in place. I added the pink sponged square to the top, then the blue and the red. When you pull it open to the first layer (and others), you'll see there are blank rectangles on the left side. These are the backs of squares. 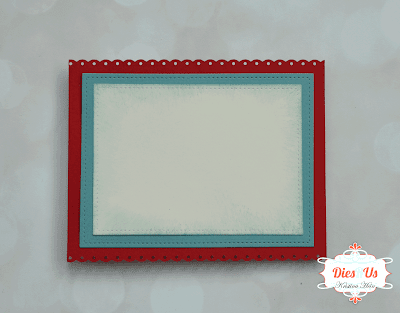 There is another die in the Frame Pull Pop-up die perfectly sized to fit these rectangle spaces. I used a solid blue, red and a pink. I started with the blue and ended with the pink. 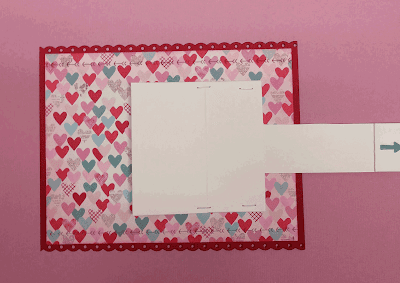 To finish decorating the rectangles I pulled out another piece of patterned paper, This one has little rectangle pieces that look like little cards. I selected three that went with the paper on the right and the solid that I used for the rectangles already glued down. I sponged the edges with coordinating inks. I then glued them in place. That just leaves the very front and bottom panel to decorate. 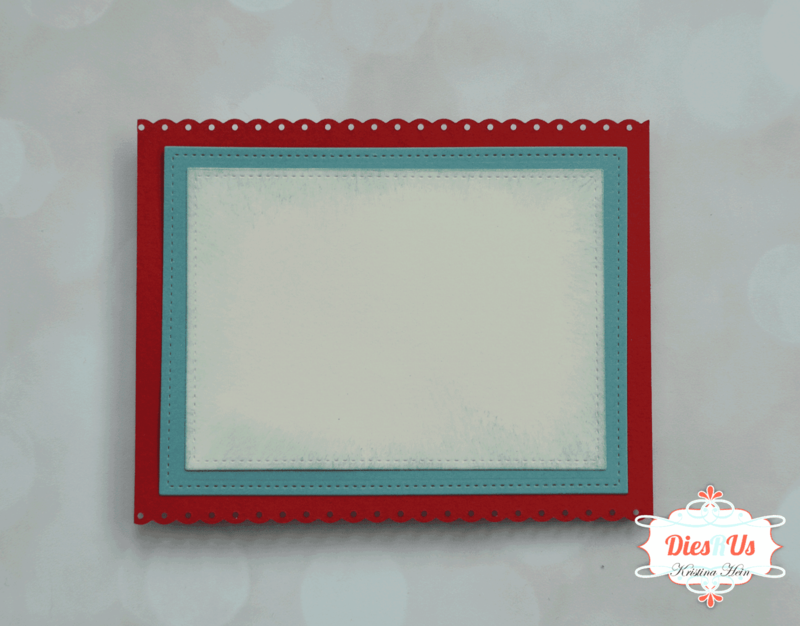 For the back panel I used 2 different die sets from Lawn Fawn. These aren't currently available in the store but there are lots of heart dies to choose from HERE. 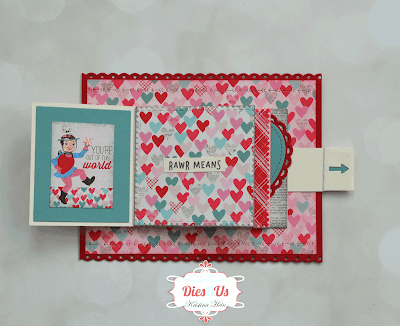 The largest heart is cut from red cardstock using the Lacy Heart Stackables. Then the blue layer is cut with the Outside In Stiched Heart Stackables. The pink layer is from the Lacy Heart set. I glued all 3 hearts together and attached it to the bottom layer. Now on to the front panel! I cut an open square frame from pink cardstock using yet another die in the Frame Pull Pop-Up set. I glued it down. 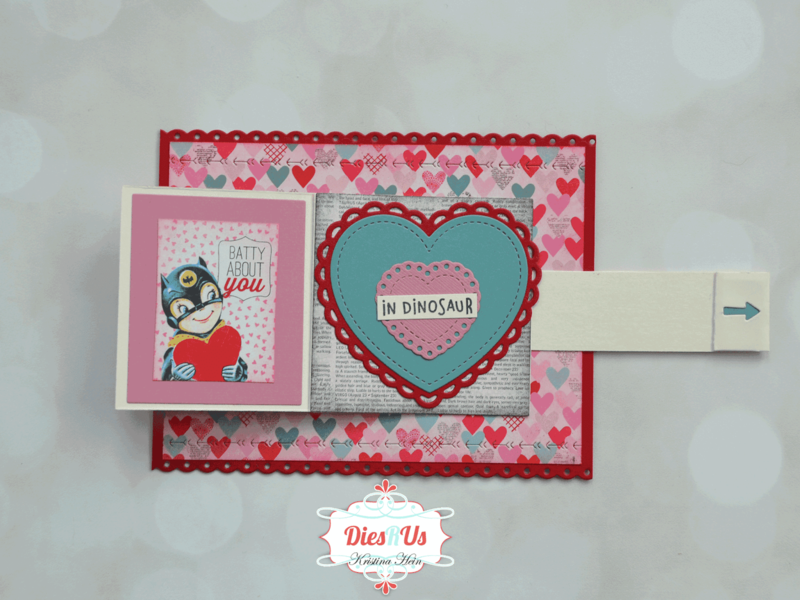 Next I stamped an adorable dinosaur from Lawn Fawn with a gray ink onto a scrap piece of ivory cardstock. I then selected several Copic markers that matched my papers and did some simple coloring. The colors I used were R81, 83, 85, 89 and BG72. I added tiny dots using the same Copic markers to add more detail. I went over the eye with a black glaze pen. I then added more tiny dot detail using a Stardust gelly roll pen. Once this was dry, I cut the dino out with the coordinating die. I stamped the little "Rawr" speech bubble with black ink. I die cut two tiny hearts from blue cardstock. These are also from the Frame Pull Pop-Up set. These sets do cost a bit more but they really are jammed full! I glued them on the panel. I also added a bit of Star Dust Stickles to the hearts. Here is a close up of each panel as you pull on the strip. I almost forgot! I stamped the sentiment from the Rawr stamp set onto three pieces of ivory cardstock with black ink. 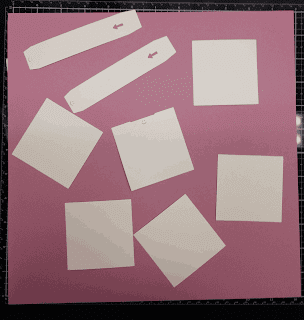 Then I cut out tiny rectangles and glued them onto the 2nd, 3rd and bottom layer. Whew! Thanks for sticking with me through all those pictures. For the very final step I added a blue stitched rectangle layer and an ivory stitched rectangle layer. I added sponged blue ink onto the edges of the ivory layer before gluing it down. I needed somewhere to add a written message! This is just so cool. I can't stop playing with it! Be sure to check out all of our great links below! I sure hope you enjoyed today's project as much as I did! 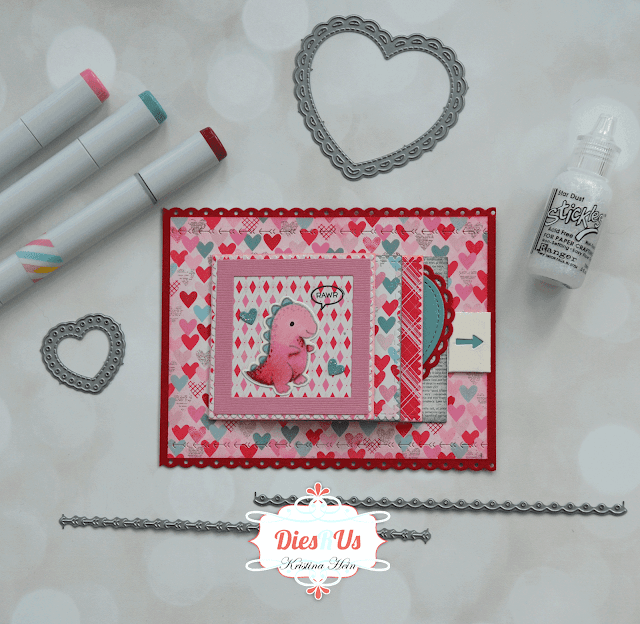 Oh what a fun and cute card! This is so adorable! What a fun card for any kid to receive! What a very fun card and so cute. Oooh, this is totally LIT!! (As my kids would say!) 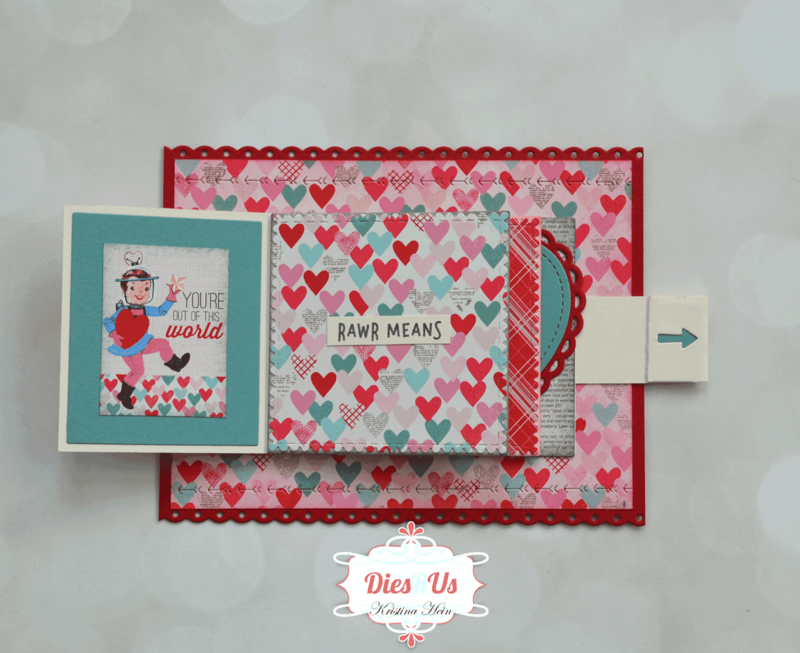 Fab work and so FUN for the recipient! Terrific design, Teamie!